Carlow manager Colm Bonnar said that retaining their Division 1 status for 2020 had surpassed anything else they've achieved in recent years, remarking that it "feels like a promotion." At first glance, Bonnar's team appeared dead and buried when they trailed Offaly 1-11 to 0-03 at half-time in Tullamore. Their plight appeared more dismal still when one considered they had Eddie Byrne sent off early on for retaliating to a foul from Niall Houlihan. But, as was the case throughout the country, the wind was having a major impact and goals in the first ten minutes of the second half from Seamus Murphy and Chris Nolan dragged Carlow back into the contest. The gap continued to narrow and narrow until Sean Whelan finally nudged the away side in front with three minutes remaining. From there, they held on to win. Carlow won the Christy Ring Cup in 2017, the Division 2 title last year and then the inaugural Joe McDonagh Cup last summer but the manager says that retaining their place in a reconfigured Division 1 for next season tops the lot. "We feel like it's a promotion," Bonnar told RTÉ Sport. "It's nearly surpassed anything like we've done so far. From winning the Christy Ring to the Joe McDonagh and the Division 2 league. And this is really like a promotion to a new Division 1. 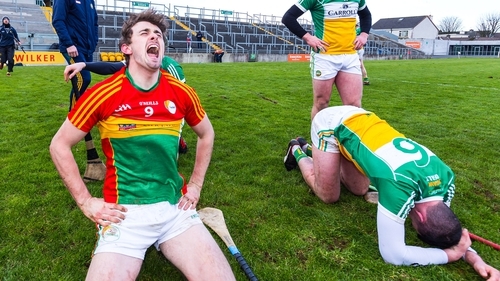 "Times are great to be a Carlow hurler. There's fellas in there in that dressing room for the last nine or ten years who soldiered on in last when things weren't good and it might have been easier to give it up. "We've got a very strong team there and they want to challenge. "And to take on a traditional team like Offaly - I know they get a lot of bad press and it's not fair on those because they're proud Offaly men - but when we got the run on them in the second half we showed we can hurl and can score. "Even with a man down, we showed huge character. Our values are very strong in terms of teamwork, unity and supporting each other." The Carlow boss insisted that he never too fatalistic even when faced with an eleven point deficit at the break, knowing that the elements would give them a chance in the second half. Though, he didn't expect his side to recover so much ground so quickly. "At half-time, with the score 1-11 to 0-03, we looked in serious trouble. Offaly were bossing us in a lot of areas all over the pitch. "I suppose the one consolation we had was we kept them to one goal. Shane Dooley had a chance there he should have possibly stuck and it would have made it very hard for us in the second half. "I thought in the last 15 minutes of the first half, we started coming into the game. We had a couple of opportunities to score and we should have had seven or eight points on the board which wouldn't have been too bad facing into the wind. "I knew we had an opportunity in the second half, if we could start at a quick pace, put a couple of scores on the board and put a bit of doubt in Offaly's head. But to get two goals in the first ten minutes, it really gave us the confidence to drive on. It made that task a bit more achievable in terms of closing the eleven point gap. "The strength of the breeze caught us by surprise. We don't normally play with seven defenders but we had to re-organise. To lose a man (Byrne) so soon in the first half as well but they'll (Offaly) be disappointed they didn't take the opportunities when they had an extra man. "We were happy to get to the dressing room at 1-11. It looked like desperation but people underestimated that breeze. It was definitely worth seven or eight points and if you get a goal with it... that's what happened." Carlow had impressed in the league phase proper, drawing with Galway and running Dublin close before a defeat to Offaly in blizzard-like conditions last weekend condemned to a relegation playoff. Bonnar admitted afterwards that defeat today would probably have marked the end of his tenure. "It would have been a killer for us. I don't think I could have stayed on as manager if we went down to Division 2. It would have been very hard to motivate those players because they just wouldn't have looked forward to it."